And in a vacuum that seems like a good thing. We are presented with new information and experiences. We re-evaluate the way we see the world and then we change our mind to think and act in a new way. The problem is that we don’t live in a vacuum. When we change our mind it doesn’t only impact the choices we make, it also impacts the other people in our lives. You might choose to leave a job, finish a relationship, or change the way you see God. When this happens the people in our lives may be impacted in practical or emotional ways. Our loved ones may struggle because they have to change their understanding of who we are and how we see the world. They might not like our new choices or they might feel challenged by them. 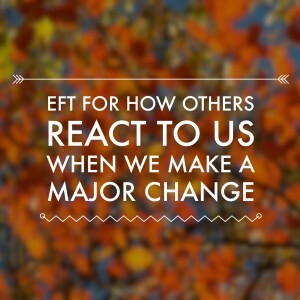 In this week’s podcast we tap for the difficulties around how others react to us when we make a significant change. This is also a great audio if you are struggling with a major change that someone close to you has made. When I got sober and clean, many of my friends were SO angry. Especially those who took substances with me. A few tried to sabotage my efforts to get clean and sober, and that made them EVEN ANGRIER. So… many people had to rock on out of my life, and I felt SO alone, but I truly wasn’t. I just felt like it. God just had to wait until I surrendered my (perceived) “control” so He could fill in all the holes.